Rum is a hard liquor made from sugarcane. Rum was first distilled in the Caribbean in the 17th centuries although alcoholic beverages produced from sugarcane, which are considered the precursors to rum, date back to antiquity. To produce rum, sugarcane juice or molasses is fermented and distilled. The distillate is aged in oak barrels. There are different types of rum depending on the peculiarities of the production process. There are dark rums, light rums, golden rums, overproof rums, spiced rums, flavored rums. The Caribbean and Latin America are the largest world's producers of rum. 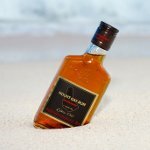 Best-known rum brands include Appleton, Montilla, Madira, Cacique, Contessa, Brugal, Havana Club, Captain Morgan, McDowell’s No. 1 Celebration, and Bacardi. Rum is a common ingredient of alcoholic cocktails such as Cuba libre (rum and Coke), daiquiri, mojito, Mai Tai, zombie, piña colada, dark 'n stormy, painkiller, hurricane etc. It is also used to make cold-weather drink including hot buttered rum and grog. Cocktails usually contain light rums while dark and golden rums are typically consumed individually either straight or iced.